Dealing with dry hair or scalp can be so annoying. If your hair is breaking or feels super dry, you can show it some love by giving it a hot oil treatment. Why and how they work? Heat opens the cuticle of the hair and allows moisture to penetrate the hair shaft. So if you havelow porosity hair (take the test), opening the cuticles is very important. What’s great about these treatments is you can use almost any kind of natural oil — it’s really about what you prefer and what you feel your hair needs. Avocado: If you have super dry and frizzy hair, avocado oil is one of the best ones for moisturizing. All those healthy fats are great for your hair. Castor: Castor oil is very thick and also good for moisturizing dry hair. But what a lot of people don’t know is that it can strengthen your hair if it’s thin and brittle. Jojoba: I love this oil — not only for hot oil treatments but for sealing in moisture. The sebum that our scalp makes closely matches the makeup of jojoba oil.This is a great oil if you have dandruff or itchy scalp. Olive:This is probably the most popular oil used because most people have some of this around the house. Olive oil is good for protecting your ends from splitting/breaking. Sesame: A great oil for shine and luster. 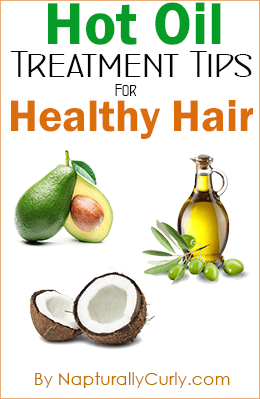 Coconut Oil: Coconut oil can really help soften your hair. You can melt it by putting it in a container and sitting the container in warm water. Argan: This oil naturally hydrates your hair and enhances the elasticity. So you can pick what benefits you desire the most and create your own mixture. I usually mix about a 1/2 cup (sometimes 1 cup) of equal amounts of oil. Got Dry Scalp/Dandruff? Add 1-2 drops of tea tree oil to your mixture. 1. Warm your oil mixture by heating plain water on the stove. Wait until the water is just about to boil and remove the pot from the stove. 2. Put the oil in a separate container (I use an applicator bottle) and place it in the pot of warm water until the oil warms up. Don’t heat the oil in the microwave because it will lose the nutrients. 3. Test the oil on your wrist before using so you don’t burn yourself. 4. Section your hair into 4-6 sections to make distribution easier and less messy. 5. Use the applicator bottle to distribute the oil throughout each section. 6. Carefully massage the mixture into your scalp and be sure to coat your ends. 7. Cover your hair with a plastic cap and let the oil treatment sit on your hair for at least 30 minutes. For added moisture, wet a towel with warm water and wring it out. Wrap the warm towel around your head for 20-30 minutes. Or sometimes I put a damp towel in the microwave for about 20-30 seconds to warm it up. Don’t worry if the towel cools off, the process is still working. 8. Shampoo and condition your hair as normal. Your hair should be noticeably softer, stronger and may even have a more prominent sheen. Every time I do a treatment I get far less breakage than I normally do when shampooing and detangling my hair. Don’t forget that there are more benefits to using oil. Not only are they good for strengthening the hair in a hot oil treatment, but you can also use them to seal in moisture. So after you’ve applied your regular moisturizer, add some oil to seal it in. In the winter months, castor oil is my favorite because it’s so thick and helps fight dryness in cold weather. For the rest of the year I normally use jojoba oil. I like the fact that it closely matches our natural skin and hair oils. I guess it makes me feel like I’m being extra natural. Just remember,sealants are not moisturizers. They lock in existing moisture. So if you put oil on your hair by itself, it will just sit there. It doesn’t penetrate. Your hair may have a dull shine and even look greasy, but that’s not the same as being moisturized. When your hair is properly moisturized, you actually don’t need a lot of oil. Just lightly coat your hands and gently rub it into your hair to seal the moisture in. I use olive oil for my pre-poo. This is when you coat your hair with oil and/or conditioner before you shampoo to strengthen the hair. Shampooing (even if you use sulfate-free brands) can strip the hair, so adding oil prior to will strengthen your hair. Look at all the wonderful uses for natural oil! Who knew? And what’s great is you can apply these tips and techniques on both transitioning and natural hair in the same way. After doing a hot oil treatment on my hair for 6 weeks in a row, it had a very positive effect on my dry scalp — something I’ve struggled with for years. 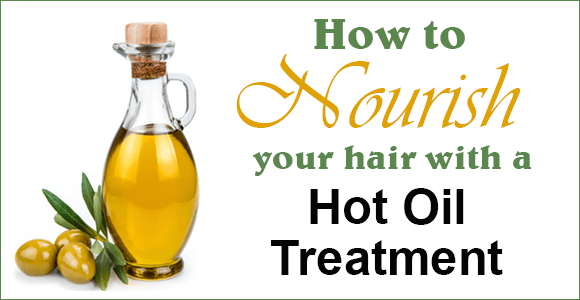 So hot oil treatments can also restore moisture to your dry scalp.